I am a huge fan of Sword & Sorcery, which is a style of fantasy that seems like being just perfect for RPGs but in practice turns out quite difficult to do. I’ve tried various things in my last campaigns (which didn’t work out to make it feel like Sword & Sorcery) and been toying with various ideas over the last year to do better in the future. My last plans were something like a focused sandbox, but that doesn’t really capture the character of the style either. Riding into the sunset and landing on unknown shores are such a major element that you can’t really leave out, but one that is incompatibile with standard sandbox campaigning. 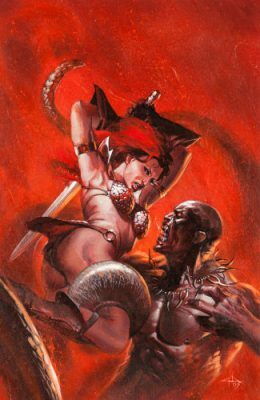 The common conventions of Sword & Sorcery have one or two protagonists who somehow have ended up in a dangerous situation. The first difference of RPGs is that you usually have three to six or more protagonists and all of them are supposed to be equally important. But even more importantly, and much less obviously, the method of starting right at the start of the action and skipping the buildup and backstory of the adventure has very different effects in literature and game. When you write a story it works just fine, and it’s tempting to do the same in an RPG to get the maximum amount of excitement out of a limited time span of four to six hours per week or month. But the context under which the characters have learned about the plot hook and their reasonings for making the decision to take it and not do something else are, while not exciting, a very important part of what defines not just their own personality but also how they perceive the things they encounter and how they react to that. It is something that I feel has to be part of the play time and can not be prepared and narrated by the GM. It’s a very important part of the players’ agency and has a major impact on how much the game feels like their adventures instead of just an adventure. This is one of the big strength of sandbox campaigning that I consider a huge advantage over episodic play. But Sword & Sorcery is a highly episodic style of fantasy. Sandboxes also have to limit themselves to a specific area while Sword & Sorcery tends to be all over the place. I want to eat my cake and have it too. And I think I found a way to do it. Preparing a whole world to let players roam freely just isn’t doable. Even if you could prepare that much material in advance, the players would most likely see only a few places and might quite well not know what they should do when everything is possible. Preparing three different adventures each session and letting the players pick one also would be a very inefficient way to prepare for a game. But I remembered the idea of the old D&D modules, which are usually a dungeon, a stretch of wilderness, and often a town. They are meant to be easily adaptable to whatever world you play in, you just have to pick a spot where you want to put them. They are obviously a bit bare bones, but that makes it easier to weave in iconic elements of your setting. When you prepare your campaign material like this you can offer players a choice of what kind of adventures their characters would want to go on while keeping the workload no higher than in an average episodic campaign. It could even be less. This type of campaign is best suited for classic adventurers. People with skill in weapons and magic who take on mercenary work for fame and fortune and go poking around in dangerous places out of greed and curiosity. At the start of the campaign you prepare three modules that each have an interesting location that is worth exploring and perhaps some trouble that is coming from there. The players get three rumors or calls for heroes that serve as hooks for each module. Each hook should include some hints at what can be expected, like pirates, a temple full of undead, fishmen attacking a village, a mysterious tower that recently appeared in the mountains, stuff like that. The players also get information about the general location of each adventure so they can take into consideration if they are interested in tropical islands, a giant swamp, or wintery mountains. 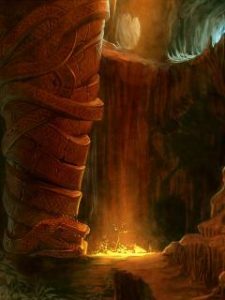 The active play may then start in the hall of a lord who has called for heroes where some of the PCs might first meet, with the PCs riding into a village nearest to the site to make their last preparations, or on a ship that reaches the island they are looking for. At either the end of the session after a module is “completed” or at the start of the next session the players again get three rumors about places that hold adventure. One of these is for a new module, the other two are new rumors for the modules they did not pick the last time. In some cases it can be appropriate to offer the same hook again, like when it’s for rumored hidden treasure or ruined castle that doesn’t go anywhere and where the hook does not include any kind of urgency. The key is to make the modules truly modular. Make them in a way that they can work in different environments and you can easily replace creatures with others more appropriate for the new location and context. If the players really don’t feel like doing something with skeletons in a desert tomb they might still be intrigued by zombies in a jungle tomb. The choice that the players make is not about dungeon floorplans, amount of treasure, or difficulty of opposition. These are all thing they know nothing about when picking which hook they want to take. The purpose of the choice is to let the players define what kind of rumors their characters find interesting, what kinds of jobs they want to take on, what goals they set for themselves, and also have a say what parts of the world the campaign is visiting. These choices are not invalidated by offering them the same module over and over until they pick it. A module is not an adventure. A module is an adventuring site with inhabitants, obstacles, and treasures, and often some kind of conflict between different groups of inhabitants. The default goal of the players is to make themselves a good picture of the place, grab the stuff they want to keep, and kill whoever they think needs killing. And how this actually works out as an adventure depends quite a lot on what expectations the players bring with them, which is based on the plot hook. Different rumors can lead to very different adventures even with the same module. Imagine for example that you either have Robin Hood looking for people to overthrow the tyrant of Sherwood Forest, or the Sheriff looking for help to defeat a group of rebellious brigands led by a rogue nobleman. If the players pick that module expecting to crush a rebellion, whatever the brigands might shout at them during a fight might sound very hollow. Even if they switch sides halfway in they still get quite a different experience than if they had picked it expecting to overthrow a tyrant. One challenge when letting the characters roam all around the setting is to have some kind of continuity throughout the campaign. Sometimes you can give the players plot hooks that lead to a town they have been to in the past and where people still remember them. Occasionally you can also have them cross paths with people they once met in completely different places, be it as allies or enemies. But the bigger the setting the less plausible does it become to meet someone a third or even fourth time. A great suggestion someone gave me is to make good use of globally or at least regionally active organizations. Even if the NPCs the party meets are people they have never met before, seeing the emblems of a group they had allied with in the past appear in a dangerous situation can be just as satisfying. Though the NPCs may not have met the party before they can have heard of them from their comrades who did. Organizations also provide a very plausible reason for meeting NPCs several times in completely different parts of the world. They may be on business for their group or have been redeployed to another stronghold. Having one such NPC appear every two or three adventures, either as friend or foe, who is leading a group of NPCs or tells the leader of the group about them creates a stronger sense of the PCs having a continuous adventuring career instead of the campaign being a series of one-shots with largely replaceable characters. This format also lends itself to open table campaigns or games with irregular attendance. Instead of a regular party the PCs would be individual adventurers, treasure hunters, and mercenaries who know each other and readily join forces when they find themselves in the same area. Better to stick together with friends that going alone or with total strangers. An interesting option is to let every player have more than just one character but only play one in any given adventure. One good reason to do so is when the party for the current game ends up with characters who would be stepping on each other’s toes. Like three expert trap finders or two wizards specialized in illusions. Another situation would be that four players want to play their thieves and so the fifth player for the session switches his heavily armored warrior for another thief so they can make the whole adventure as a team of ninja. Or perhaps past events between two PCs make it seem unlikely that they would cooperate on the objective of the current adventure. Or two characters end up always travelling together but one of the player doesn’t play as regularly as the other. I think a good practice would be to always give each player’s unused characters half the XP that the currently active character gets. (But no equipment.) This makes it worthwhile to have secondary characters that only get used rarely as they don’t fall hopelessly behind. If you run an open game where the players are different every session you can also sometimes run into the situation that an adventure can’t be wrapped up quickly and needs another session. You might not be able to get the same group together before the next game but can agree on a time slot in the near future. Then you can put that adventure and the PCs on hold for the time being and any of the players who shows up for the next regular session can then play one of their other characters. I think this approach might actually be the closest you can get to the experience of classic pulpy Sword & Sorcery tales. It does require a little bit of extra work before the first session starts, but after that it’s really no more than for any other episodic campaign. When the adventure is over you have to create one new one. Maybe occasionally update another module for a higher level of characters. But preparing a location based adventure is generally a lot less work tha creating a plotted one as you see with most published adventures these days and the last 30 years. And when you look at many of the stories this is really how they are structured. Take the Conan, Lankmar, or Witcher stories for example. Usually they take place entirely in single location over the span of just a few hours. It can be as simple as The Scarlet Citadel or as elaborate as Red Nails. Both are really just a location in which Conan encounters a situation and then gets himself involved. He makes deals and takes sides, but mostly it’s about exploration and fighting opponents. The plot is really just how he reacts to the people he meets. It’s rarely about any multistage plans of the villains or investigations over several scenes. But the use of plot hooks the players can choose from is what elevates this approach over the standard dungeon crawl just for gold.